RUSH: Now, you Millennials are young enough, you may not have been listening to this program January 16th, 2009. On January 16th, 2009, the day before, I had been contacted by the Wall Street Journal. Obama was yet to be immaculated. That would be five days later. The Wall Street Journal was asking highly reputed, relevant commentators to submit 400 words on their hopes and dreams for the new Obama administration. And I came here to the Golden EIB Microphone, and I told my audience my reply to the Wall Street Journal, sound bite number one. RUSH ARCHIVE: I don’t need 400 words, I need four: “I hope he fails.” What are you laughing at? See, here’s the point. Everybody thinks it’s outrageous to say. Look, even my staff, “Oh, you can’t do that.” Why not? Why is it any different, what’s new, what is unfair about my saying I hope liberalism fails? Liberalism is our problem. Liberalism is what’s gotten us dangerously close to the precipice here. Why do I want more of it? I don’t care what the Drive-By story is. I would be honored if the Drive-By Media headlined me all day long: “Limbaugh: I Hope Obama Fails.” Somebody’s gotta say it. RUSH: And they did. They headlined it exactly that way. 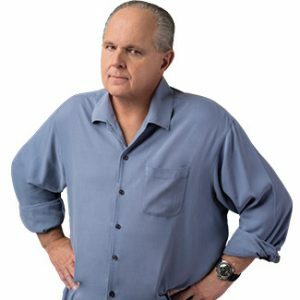 “Limbaugh: I hope Obama fails.” What they purposely got wrong was they reported that I was hoping America failed, that I was so rank partisan that I was willing for my country to suffer in order for Obama’s presidency to fail. And it was the exact opposite. I wanted Obama to fail so that my country would not. I wanted Obama’s liberal agenda, his socialist community organizer agenda to fail. I did not and never have and never will want America to fail. Never. No way. This was my point of trying to articulate the difference. I wanted Obama to fail implementing things like Obamacare. I wanted Obama to fail in letting the Iranians have nuclear weapons. I wanted Obama to fail at keeping our borders open. I wanted Obama to fail at everything he did. I wanted Obama to fail at the stimulus. I did not want America to fail. I wanted America to be saved. Well, I made that distinction every day for a month. Even my first nationally televised address to America at the CPAC convention in February, I went through it there on national TV, four networks, just as I did to you here, and it continued to be misrepresented, it continued to be portrayed as I was hoping America would fail. And it still is. Nine years later, folks, and they can’t let go of it. Saturday night, CNN The Axe Files. This is David Axelrod. I guess he’s got a podcast that CNN somehow televises. Or maybe it’s the CNN show that becomes the podcast, I don’t know. But David Axelrod spoke with noted political theoretician and scientist, Tom Hanks, about the Trump administration. And to set things up, Axelrod brings me up. AXELROD: And I thought back to, at the beginning of the Obama administration when I was in the administration, Rush Limbaugh said, “I’m rooting for the president to fail,” and I thought, particularly at a time of national emergency, that was a terrible thing to say, and so I felt you owe that next president the same presumption. We’re now 10 months in. Where do you think — how would you evaluate him? RUSH: Are you trying to tell me these clowns do not want Trump to fail? They damn well are trying to get rid of Trump. It’s not just Trump failing; they want Trump gone! But here they are trying to occupy the high road. Yes, when Trump was elected, I never said like Limbaugh did (imitating Axelrod), “I hope he fails. That would be very unbecoming. We don’t want our presidents to fail. Now we’re 10 months in, Hanks, and what do you think? Is it worth getting rid of Trump?” I mean, that’s what they’re talking about here. HANKS: — that was always say the right things. HANKS: — always feed your base, always say just glittering generalities about whoever, anybody, because you don’t want to offend, and that is translated I think to you don’t want to tell the truth about what your opinions are. Here’s a guy that you can’t stop. RUSH: Let me translate that for you. What Hanks is saying is, the country had tired of politicians who never tell you what they think, who always sugarcoat things, who always talk and act in a politically correct fashion. You don’t trust them, they seem disingenuous, and we want somebody real. And here came a guy who was real, and he talked real and people didn’t care because they were so fed up with the way the establishment has bollixed everything up that they were willing to take a risk on the real guy. And Hanks is right. Something profound came, and they still can’t deal with that. You know, how many of you think they’re running around, “My God, we’ve lost Weinstein, we’ve lost Matt Lauer, we’ve lost Garrison Keillor, we’ve lost all of our heroes, and that ne’er-do-well Trump is still there?” They’re driven insane by this. They even dragged Billy Bush out. Did you see this? They dragged Billy Bush out, gave him an op-ed in the New York Times on Sunday. “Yes, Trump. You did say it. You did say you like grabbing you-know-whats. You did say it. It’s not fake.” So Billy Bush is falling on his sword ’cause he’d do anything to get back in the business. And Trump is still there, and they can’t deal with it. Now, let’s go to The View. This is this morning on the view. Meghan McCain’s over there now. She left Fox News to go to The View. They’re talking about Brian Ross being suspended for his report on Friday that Trump as a candidate told Flynn to contact the Russians. This is what Meghan McCain said. MCCAIN: I remember when Obama was in office, Rush Limbaugh saying, “I want my president to fail.” And coming out and saying I could never get behind that because if our president fails, it means America fails. I feel the same way about Trump. I think if we’re celebrating a breach of national security, something that is so egregious that — I said this on Friday, it’s gonna tear our country apart — there’s no need to be cheering and celebrating. RUSH: Meghan, your guy reported a lie. There wasn’t anything of the sort. Trump did not, as a candidate, tell Flynn to talk to the Russians. But here she even says it. “You remember when Rush Limbaugh said, ‘I want my president to fail’? That’s like saying it means America fails.” No, Meghan, no, no, it’s the exact opposite. I didn’t want Obamacare. I didn’t want national health care. I didn’t want the government opening the borders. I didn’t want rampant, unending illegal immigration. I didn’t want Kate Steinle to get murdered because of sanctuary cities. I didn’t want anything that’s happened. I don’t want $10,000 deductibles and $30,000-a-year insurance premiums for health care. I didn’t want anything we’ve got. That’s what I meant. And they all know it.